Mercedes-Benz AMG GTS-Class PDF Workshop and Repair manuals, Wiring Diagrams, Parts Catalogue, Fault codes free download! Mercedes-AMG GT (internal index C190 for the coupe and R190 for the roadster) – a two-seat and two-door sports car from the German company Mercedes-Benz and Mercedes-AMG, the successor to the Mercedes-Benz SLS AMG. The presentation of the car took place on September 9, 2014, the official world premiere for the general public was held in October 2014 at the Paris Motor Show. At the beginning of 2017, there are several modifications of the car: GT / GT S coupe, GT3, GT R and roadster GT Roadster and GT C Roadster. The Black Series version was also officially confirmed. All versions are assembled at a factory in Sindelfingen, Germany. The Mercedes-AMG GT is positioned as a competitor to the Porsche 911, Jaguar F-Type, Maserati GranTurismo. The interior of the Mercedes-AMG GT was first introduced to the public on April 16, 2014. The presentation of the GT itself was held on September 9 of the same year at the Paris Motor Show. The first running versions are the GT (350 kW, 476 hp, 600 N · m) and GT S (375 kW, 510 hp, 650 N · m). 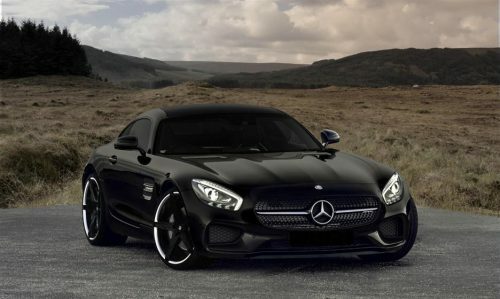 On sale Mercedes-AMG GT appeared in 2015 at a price of $ 129,900 . Mercedes-AMG GT – the second model, fully developed by engineers from Affalterbach. Mercedes-AMG GT S is the current safety car in Formula-1, making its debut in this role at the Australian Grand Prix 2015. Tobias Mears, CEO of Mercedes-AMG GmbH, promised to release versions of the Mercedes-AMG GT Black Series and GT3 (racing and street versions) in order to compete with the Porsche 911 GT3. In March 2015, at the Geneva Motor Show, Mercedes-AMG officially introduced the Mercedes-AMG GT3, a racing version of the GT, which will be equipped with an atmospheric M159 V8 engine with a working volume of 6208 cc (the same is installed on the SLS AMG GT3). The car will be made mainly of carbon-reinforced polymer in order to reduce the weight of the sports car to 1,300 kg (2,900 pounds) in order to comply with the rules of the FIA ​​for racing. It is expected that the car will go on sale in 2016. According to the English edition of Motor Trend in November 2015, the division Mercedes-AMG is preparing a new modification of the AMG GT coupe. The novelty will be called Mercedes-AMG GT R and will be presented on June 24, 2016 at the Goodwood Festival of Speed. In comparison with the usual GT, the new car will become lighter for 80-100 kg, there will be a full-fledged chassis, active aerodynamic elements and adjustable shock absorbers, a powerful braking system and large wheels. Under the hood of the Mercedes-AMG GT R, it is expected that a modernized 4.0-liter turbocharged V8 engine will be installed, whose maximum power can grow to 404 kW (550 hp). With such data the car can accelerate from 0 to 100 km / h in just 3.4 seconds, which is 0.2 less than the S modification. In an interview with Car and Driver, Tobias Moers, the head of the sports division of Mercedes-Benz, said that the modification of the GT R will differ from the GT / GT S variants not only with power and a revised suspension, but also with active aerodynamic feathering. Concern Daimler AG announced the launch of the AMG GT R version in June 2016. As expected, the car was equipped with a turbocharged 4-liter gasoline engine with direct fuel injection. Power of the power unit was 430 kW (585 hp). With this engine and the same 7-speed robotic automatic transmission AMG GT R accelerates from 0 to 100 km / h in 3.6 seconds. The maximum speed is 318 km / h.